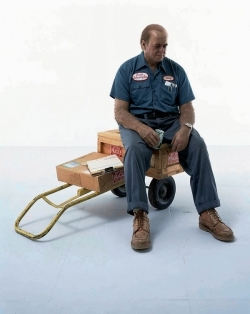 Since the early 1970’s Duane Hanson has been making startlingly lifelike sculptures of middle America accomplished through a complex process of casting from live models, recreated in bronze or fibreglass resin. 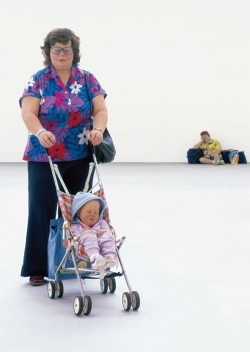 Duane Hanson concentrated on the naked fact of the subject, an astonishingly persuasive counterfeit of another human being as a fully realised physical presence. 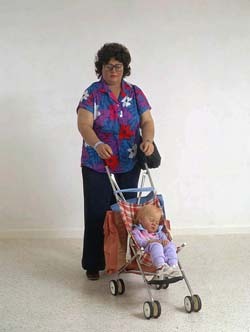 When describing this sculpture Duane Hanson said: ‘I like the physical burdens this woman carries. 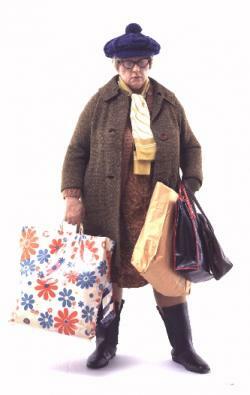 She is weighted down by all of her shopping bags and purchases, and she has become almost a bag herself. She carries physical burdens – the burdens of life, of everyday living. But initially, it’s quite a funny sculpture’. 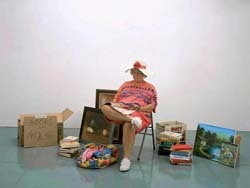 Duane Hanson’s sculptures are like minutes from a slice of life, frozen for pause and contemplation. And unlike looking at real people you get the chance for an up-close, unblinking gawp. Queenie can be understood on one level as the personification of all those resigned-looking women who drag their bodies around in pursuit of the mess created by the rest of us. But we are made to confront the fact that such women, who are usually invisible and ignored, are not just faceless domestics. 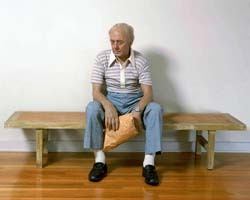 Duane Hanson’s hyper-real Old Man on a Bench is in a peculiarly modern predicament of drifting or simply existing, merely marking time on his way from birth to death. 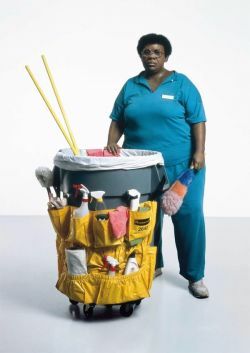 The insistence on the irreplaceability of each person, and on the dignity to be accorded to those who are usually overlooked or spurned as ordinary are central to Duane Hanson’s art and humanitarian vision. 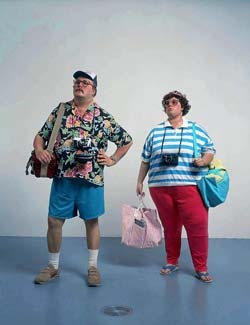 Duane Hanson’s sculptures of people are just too believable. Creating vignettes of real American life, he doesn’t forget a single detail. 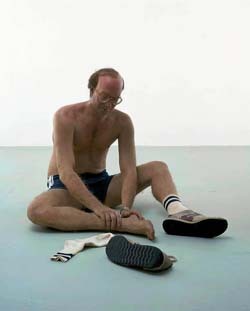 Casting his figures from live models in his studio, Duane Hanson then adorned them with every attribute of life-likeness from tiny body hairs, varicose viens, bruises, and hangnails. He hand picked their clothes from second hand shops, and accessorised them accordingly. The truly radical nature of Duane Hanson’s procedures – by which casts were made directly from the body and head of a particular but anonymous person with exception of Jogger a doctor friend of Duane Hanson who volunteered for the mold-making sessions, and whose body type fit perfectly with his idea. Reassembled into a complete figure, ilusionistically painted for the most convincing skin-tones and finally dressed in actual clothes. 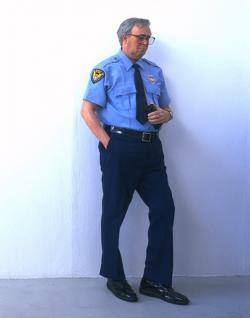 Duane Hanson judged the success of his work insofar as it obscured all traces of his subtle interventions so the figure appeared to be nothing more than a three dimensional replica of an actual person. The Traveller snoozes sunburned and hung over in a pile of cheap luggage waiting exhaustedly for a connecting flight home.